Curt Adoph Netto, who authored Papier-Shmetterlinge aus Japan, is perhaps a less well-known name even amongst the more versed Japanese art enthusiasts. Netto arrived in Japan in the early Meiji period as oyatoi gaikokujin, or foreign advisors hired by the Japanese government. He worked as the first Professor of Geology as well as Mining and Metallurgy at the Faculty of Science of Tokyo University, making Netto one of Japan’s metallurgy pioneers. Netto was born in Freiburg, Saxony in 1847. He studied at Technische Universität Bergakademie Freiberg between 1864 and 1869 where his mine inspector father and grandfather studied. There, he proved to be a star pupil having received an academic excellence award in the first year and scholarship in the second and third years. After leaving school, he spent a year doing military service and in 1870 obtained a job at a smelting factory in his hometown. He saw battle and was injured in the Prussian-Franco war for which his combat effort was honoured with the decoration of the Iron Cross (second class). After the war, he worked as a chemist at an enamel workshop. In 1873 at the age of 26, he was invited to Japan as lecturer in mining by a member of the Iwakura delegation visiting Germany. In Japan, he was involved in the development of a mine in present day Kosaka City in Akita prefecture where his expertiese helped modernise the mine. With a change in the Meiji government’s policy in 1877, however, Kosaka mine was leased to the Nambu family, who was once the former feudal lord of the region. This led to a change in Netto’s career path in Japan, and he was given the first professorship post at the newly established Mining and Metallury section at the Tokyo University’s Faculty of Science with a salary of 350 yen a month, a generous rate that was equivalent to those received by state ministers at that time. For the next seven years until 1885 with the exception of a one-year sabbatical, he taught metallurgy to a number of students studying at Tokyo University. His contribution was recognised by the Meiji government and he was conferred the Order of the Rising Sun fourth class bestowed by the Meiji Emperor in 1885. He left Japan in 1886. Netto unfortunately kept most of his personal savings with a Chinese bank in Guangzhou, which collapsed soon after his return from Japan to Europe. 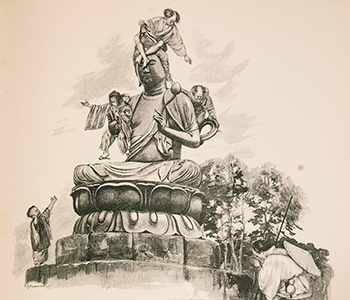 This plummeted Netto into a financial ruin and forced him to sell a large part of his ukiyo-e collection he amassed while in Japan to his friend, the firmly established Japanese art dealer Samuel Bing (some observers speculate the possibility that a few of the ukiyo-e prints bought by Van Gogh from Bing are those which were once in Netto’s collection). He developed and obtained patent for a technique to chemically refine aluminium, but that effort too was soon after superseded by a Swiss developer who created a method of refining the metal through using electricity. In 1889 he moved to Frankfurt to take up post as the head of the technology department of the Metallgesellschaft company. He retired owing to health reasons in 1902 and died of a cardiac arrest in 1909. Netto’s life as presented thus far illustrates a stern and serious man focused on science. But this was only one of his many personality facets. Netto was also artistically minded. When he was working in a mine in North eastern region of Japan, he often drew pictures when he faced difficulties in conveying his ideas with the locals. He also learned nihonga from a Kano school painter and was given the artist name Shôtai. A number of his sketches were donated to the Kosaka City’s Kyôdokan museum by his granddaughter Alice Ebert Netto in 1987. Although the explanatory text is only available in Japanese, the sketches can be viewed on-line through their website. The images reveal Netto’s warm and compassionate attitude towards the ordinary country people he met during his sojourn. 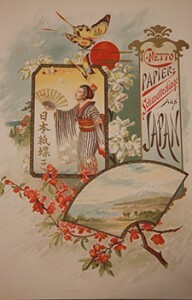 Papier-Schmetterlinge aus Japan introduced in this issue and gifted to the Lisa Sainsbury Library by Sir Hugh Cortazzi was published when Netto was 41 and two years after his return to Europe. It centres on illustrations of sketches Netto made while in Japan. The book is an account of the simple ordinary lives of the Japanese shown through a series of vernacular life sketches. 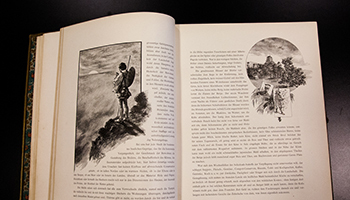 Inside the book are three full-colour image plates in addition to a number of illustrations. 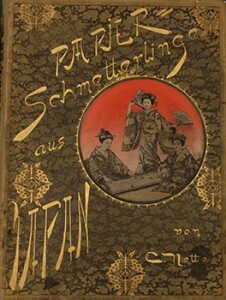 All of the images presented are available digitally in black and white from the International Research Centre for Japanese Studies’ website by scrolling down to ‘Papier-Schmetterlinge aus Japan; NETTO, C.’ in the list and clicking on the corresponding PDF link. The book was bound by Paul Bender. The lavish leather cover is decorated with embossed gold in-filled details. The cut out roundel reveals a finely engraved image of Japanese women. The endsheets are also sumptuous with geometric floral pattern and gold accents. All three edges are gilt in gold. 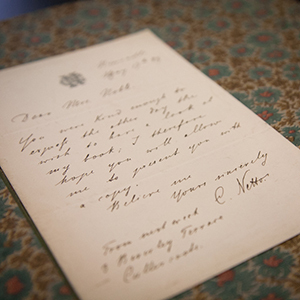 The copy in the Lisa Sainsbury Library also includes a handwritten compliment note by the author and a signed note by Netto on a ‘CN’ monogrammed letterhead. The letter dated 17 May 1889 written during Netto’s travel through Newcastle mentions how he hoped that by the following week he would have reached the seaside town Cullercoats near Newcastle. The Beverley Terrace where Netto refers to and most likely stayed is still standing in Cullercoats. Wolfgang Michel: Curt Adolf Netto : Ein Deutscher im Japan der Meiji-Ära. Nishi-Nihon Nichi-Doku Kyōkai Nenpō 8 Fukuoka 1984, pp. 13-21.